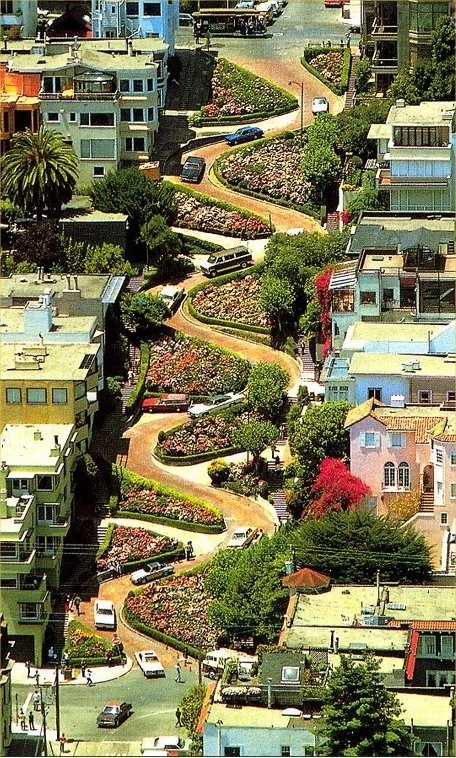 Lombard Street is an east–west street in San Francisco, California. It is famous for having a steep, one-block section that consists of eight tight hairpin turns. The name of the street is said to originate with Lombard banking (an early type of pawn shop) which itself has ties to the Northern Italy region of Lombardy. Lombard Street begins at Presidio Boulevard inside The Presidio and runs east through the Cow Hollow neighborhood. For twelve blocks, between Broderick Street and Van Ness Avenue, it is a principal arterial road that is co-signed as U.S. Route 101. Lombard Street then continues through the Russian Hill neighborhood and onto the Telegraph Hill neighborhood. At Telegraph Hill it breaks off to the south, becoming Telegraph Hill Boulevard, leading to Pioneer Park and Coit Tower. Lombard Street starts again at Winthrop Street and finally terminates at The Embarcadero as a collector road.